I got a few emails asking if I can talk more about my beloved Hermes Kelly bag so here we go...I am not a fan of their business model nor I can afford buying Hermes pieces on a regular basis just to be in their system. However, I completely understand the theory behind it. With that being said, I knew finding a pre-owned bag is the way to go for me. Leather type: Mine is in Swift (matte, fine-grained) leather. Swift (formerly known as Gulliver) is one of the most common/popular Hermes leather types along with Togo (grained calfskin), Epsom (embossed leather) and Clemence (soft calfskin). I am open to all leather types except Box calf (smooth with a shiny finish) leather. My 1st choice would be Togo leather, my 2nd choice would be Epsom. My 3rd choice would be Swift or Clemence. Size: I was debating between the 28(cm) cm and 32(cm) size. Both would work for my frame but ultimately went with the 32(cm) as I have other smaller bags. Hardware: The palladium hardware is a no-brainier when it comes to hardware selection. I have silver hardware on most of my bags and think it gives off a more casual vibe. Color: A criteria that I spent most of my time thinking about is the color. 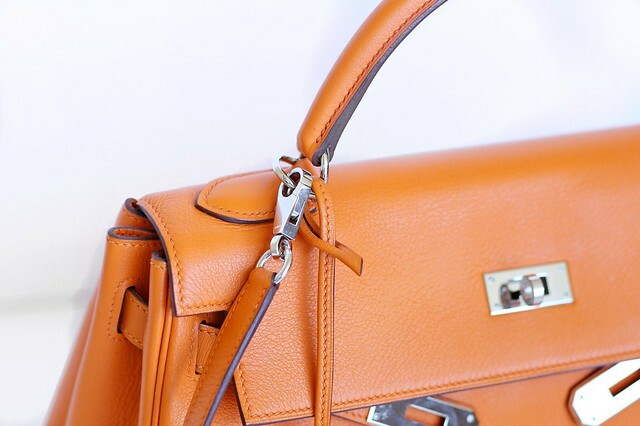 Orange is not a typical color when it comes to handbags but if you're going to buy an orange bag, might as well get the Hermes signature color. After using it for awhile, I can honestly say it's a very versatile color. It goes with tan, blue, white, brown or any neutral shades. It's such a happy color. Since I tend to wear mostly neutral outfits, I love to use the bag as a pop of color. The bag is fully lined in leather with one big zippered pocket and 2 slip pockets. It's quite spacious inside. Being a fan of small bags, the Kelly 32 can hold everything I need plus extra room to spare. The bag comes with a shoulder strap which was one of the deciding factors as why I went with the Kelly instead of the Birkin (I will talk more about that subject in another post). The trap is removable but not adjustable. Luckily, it's the ideal length for me at 33". I don't normally talk about prices on here because it's a touchy subject. 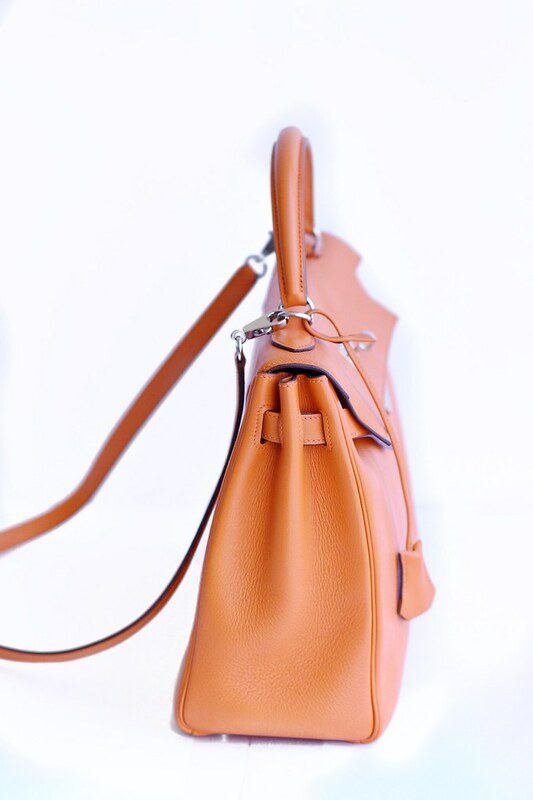 Oftentimes, you'll see Hermes bags are listed for more than the retail price from high-end consignments sites. I think it's important to know how much these bags actually cost before considering a pre-owned option. 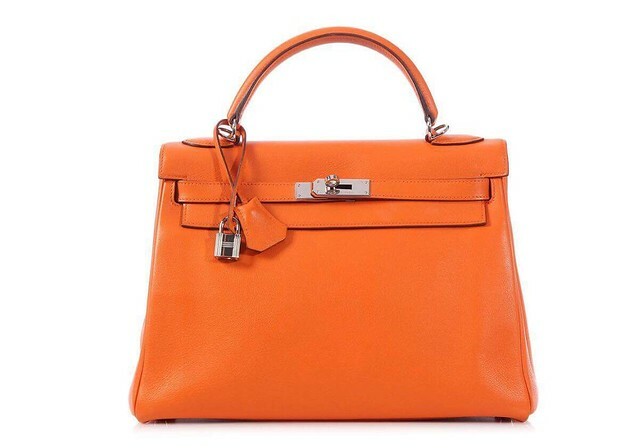 Depends on the the leather and color combination, a Hermes Kelly ranges from $10200 (Retourne) to $11200 (Sellier). For pre-owned options, depending on the year/leather/color combination, prices can be all over the place. My final thought: Since I started collecting handbags, I knew one day, I'd add an Hermes bag to my collection. Is it a practical bag? No. Is it something that I can see myself wearing often. Absolutely not. However, this is a collector's item and it makes me smile every time I see it.